Vance Stephens who is one of the creators of the Webheads network is one of the people who constantly inspires me with his thinking and writing. Today I read this article and this article. It pointed me to this blog where a short video video gives a quick over view of what MOOC is. Follow the other articles in this blog from one written May 28, 2011 to the most recent and you can see how a MOOC has been developing around an "e portfolio" course. You may be interested in the topic, or like me, you may be interested in the networked learning process. 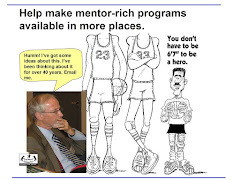 The second article makes the connection between Josh Grobin, volunteerism, mentoring, and the innovative thinking of Sir. Ken Robinson, which you can see in the video below. In sharing these links I'm trying to inspire people in Chicago and throughout the world to see that volunteer-based non-school tutor/mentor programs reaching youth in inner-city neighborhoods could provide the type of learning sparks and opportunities Robinson envisions, even when they are not provided by the local public or private school. 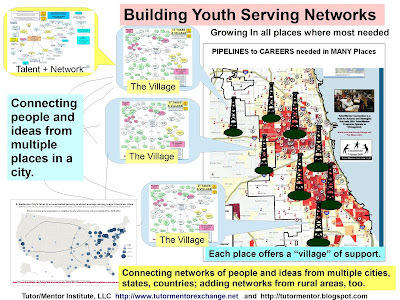 Since I can only reach a few people with my own articles, and there is so much information to learn if we want high-quality tutor/mentor programs to be available in most of the high poverty neighborhoods of big cities like Chicago, the ideas of a MOOC really appeals to me. It's a way to organize the information I've collected in the Tutor/Mentor Institute and share it with thousands of other learners, collaborators and experts who have their own ideas to contribute to this process. Learn more about MOOCs. Learn more about what motivates volunteers to give more time and talent to a cause than paid workers often do on a job. Think about how these ideas intersect in a long-term process of learning, innovating and actions. UPDATE: 8/22/2011 - This slide share by Vance Stevens provide a great deal of additional information about MOOCs and self-directed learning. Imagine a MOOC timed to coincide with the November 2011 and May 2012 Tutor/Mentor Leadership and Networking Conferences, or with the National Mentoring Month event in January.